Review: Nexus 5 delivers basics at great price. NEW YORK: You don't get a lot of frills with Google's new Nexus 5 phone. There's no fingerprint reader, no waterproof covering, no sensor to detect eye movement or hand gestures. What you get is an Android phone that's very good at the basics - for an excellent price. The phone costs $349 and is sold unlocked, without any contract requirements. By contrast, contract-free prices for many top phones exceed $600. For significantly less, the Nexus 5 does a lot of the same things well. The high-resolution screen on the Nexus is among the best, comparable to flagship phones from Samsung and HTC and sharper than the iPhone. The display measures nearly 5 inches diagonally - on par with leading phones, yet not so big that it's hard to hold and make calls. The camera isn't superb, but takes decent shots. 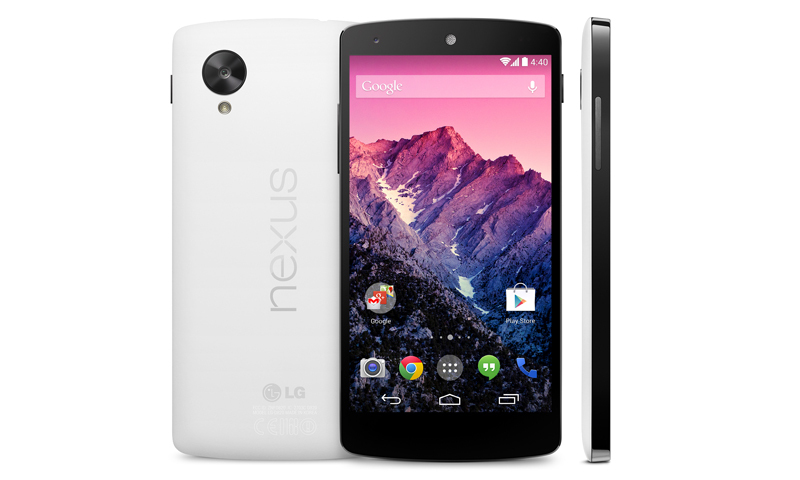 The Nexus also supports 4G LTE cellular networks. And because it's designed by Google, you are getting as close to a pure Android experience as you can get, without clutter or gimmicks that many phone makers add to distinguish their phones from rivals. You're also getting the latest: The Nexus is the first Android phone to offer version 4.4, known as Kit Kat. It could take weeks or months for other phones to get Kit Kat. I only wish the Nexus is compatible with Verizon, but its network uses different technology. The Nexus works with just about every other US carrier, as well as several in Europe. The Google Now voice assistant takes center stage in the Nexus 5. The voice recognition technology seems better than before. I was surprised how well it picked up my commands in noisy environments. The Nexus borrows a hands-free feature found in the Moto X phone from Google's Motorola division. Simply say, "OK, Google," instead of pushing a button, to make a voice command or search request. But the Nexus doesn't let you use this feature to unlock the phone like the Moto X. Unlike the iPhone's Siri voice assistant, Google Now tries to anticipate what you need and offer that before you even have to ask. It delivers information based on past search requests, Gmail traffic and other ways you use Google services. The more you use it, the more it learns. On the Nexus, you can access all that by swiping from the left of the screen, rather than finding and tapping a search box or waiting for a notification. As for Kit Kat, the most useful improvement is its new phone dialer. What you'll probably notice first is the lack of a numeric keypad when you open it. Instead, you get boxes showing favorites, frequent contacts and recent or missed calls. It's an acknowledgement that few people know phone numbers anymore. We tend to make calls from contact lists. What if it's a business that's not in your contact list? Type it into the search box. The phone searches both your contact list and the Web simultaneously. Start typing in "Dunkin' Donuts" or "toy store," and Google will find the ones that are closest to you. If you still need the numeric keypad, it's an extra tap to get it. A new Caller ID feature goes beyond what's available in standard directory assistance by drawing data from Google Places business profiles. I wasn't too impressed, though: Telemarketers came in with just the phone number, so I don't see that it's a business I ought to avoid. Kit Kat also combines text messaging and chats in one app, Hangouts. It's similar to what Apple does with Messages. The difference is that text and chat streams are treated as separate conversations, which can be disjointing to follow. With Apple devices, all that is managed in one stream for a more natural conversation flow. You should expect the Kit Kat features on other Android phones when they get the operating system in the coming weeks and months. Meanwhile, I like the clean layout on the Nexus. Icons are larger, and extra home screens aren't created unnecessarily by default. You create them as you need them by dragging an app to the right. The main camera's 8 megapixels is comparable to the latest iPhones. The iPhone 5S has better auto focus, but the slightly blurry test shots taken with the Nexus still look better than what I often see on Facebook. The Nexus supports wireless charging, though the charger is sold separately. If you get it, you can ditch the micro-USB cable and simply rest the Nexus on the charger. The Nexus also has a chip for near-field communications, which helps with mobile payments and file sharing. The phone itself is made by LG Electronics Inc., based on Google's designs. The new features aren't revolutionary, yet Google succeeds in showcasing what Android can be. Although other high-end phones are available for $100 or $200 with two-year service agreements, many people are now shelling out the full retail price for phones, driven in part by frequent-upgrade programs and contract-free service plans that wireless carriers are starting to offer. The price of the Nexus 5 makes it even more tempting to ditch phone contracts and the subsidies that typically lock you in.